The Beastmaster is a 1982 sword and sorcery film directed by Don Coscarelli and starring Marc Singer, Tanya Roberts, John Amos and Rip Torn. Loosely based on the novel The Beast Master by Andre Norton, the film is about a child who is stolen from his mother's womb by a witch. The child grows into Dar, who has the ability to communicate telepathically with animals. Dar grows up in a village, where he learns to do battle, but the village is destroyed by a race of beast-like warriors under the control of the sorcerer Maax. Dar vows revenge and travels with new friends to stop Maax from causing any more problems. Commercially The Beastmaster was not considered a box office success during its original cinematic run; however later it received extensive television exposure and success on cable in the American market on channels TBS and HBO. The original film spawned two sequels as well as a syndicated television series that chronicled the further adventures of Dar. In the kingdom of Aruk, the high priest Maax [/ˈmeɪ.æks/ MAY-aks] is given a prophecy by his witches that he would die facing the son of King Zed. Learning of Maax's scheme to murder his child as a sacrificial offering to the kingdom's god Ar, Zed exiled Maax and his followers from the city. However, Maax sent one of his witches to transfer the unborn child from the womb of Zed's queen and into a cow to be born. After his birth the witch brands the infant with Ar's mark, but is killed by a villager who takes the infant in his care and raises him as his own son. Named Dar while raised in the village of Emur, the child learns how to fight while advised by his father to keep his ability to telepathically communicate with animals a secret. Years later, a fully grown Dar witnesses his people being slaughtered by the Juns, a horde of fanatic barbarians allied with Maax. Dar, the only survivor of the attack, journeys to Aruk to avenge his people. In time, Dar is joined by an eagle that he names Sharak, a pair of thieving ferrets he calls Kodo and Podo, and a black tiger whom he names Ruh. Eventually, Dar meets a redheaded slave girl called Kiri before getting himself lost and ending up surrounded by an eerie half-bird, half-human race who dissolve their prey for nourishment. As the bird men worship eagles, they spare Dar when he summons Sharak and give him an amulet should he need their aid. Dar soon arrives at Aruk where Maax had assumed total control with the Juns' support and subjects the people to watch their children being sacrificed. After having Sharak save the child of a townsman named Sacco, Dar learns that Kiri is to be sacrificed. On his way to save her, Dar is joined by Zed's younger son Tal and his bodyguard Seth, learning that Kiri is Zed's niece as the three work to save her. While Seth goes to gather their forces, Dar helps Kiri and Tal infiltrate the temple and save the now eyeless Zed and while escaping from the temple's beast-like Death Guards and Maax himself, leading his small coven of evil witches. Consumed by thirst for revenge, Zed refuses to listen to Dar's warning against ordering an immediate attack on the city and rejects him as a freak. Forced to leave, Dar later learns that his friends are captured and races to Aruk to save them from being sacrificed. In the conflict that follows, Maax reveals Dar's relationship to Zed before slitting his throat and facing the Beastmaster. Despite being stabbed, revived by his remaining witch before she was killed, Maax is about to kill Dar when Kodo sacrifices himself to cause the high priest to fall into the sacrificial flames. But the victory is short-lived as the Jun horde is approaching Aruk, arriving by nightfall to face the trap Dar and the people set for them. Tal is wounded as Dar succeeds in burning most of the Juns alive while defeating their chieftain before the bird-men arrive to consume those remaining. The following day, though Seth learned that he is Zed's firstborn, Dar explains that Tal would make a better king as he leaves Aruk. Dar sets off into the wild with Kiri, Ruh, Sharak and Podo (who has given birth to two baby ferrets) on the path to new adventures. Beastmaster began with a screenplay in the early 1980s written by Paul Pepperman and Don Coscarelli. The two writers based their film on Andre Norton's 1959 novel The Beast Master. The writers changed the story dramatically as the original novel had the hero named Hosteen Storm who was a Navajo fighter in a futuristic science fiction setting. Norton was unhappy with the liberties taken with the film's script and asked for her name to be removed from the credits. When Coscarelli signed on as a director, Pepperman became the film's producer and brought in co-producer Sylvio Tabet to the project. The producers went to raise funds for the film at the 1981 MIFED film market in Milan and at the 1982 Cannes Film Festival. The budget of $9 million was raised, giving director Coscarelli his highest budget to work with up until that point in his career. Coscarelli was frustrated while making the film, during which he feuded with the film's executive producer predominantly over the film's editing and casting. Coscarelli originally wanted Demi Moore for the role of Kiri, but the executive producer overrode his choice and had Tanya Roberts cast. The role of Maax was originally written for Klaus Kinski, but he was not cast over a salary dispute. The film was shot over the course of five-and-a-half months. The film was shot in California's Simi Valley and in Los Padres National Forest's Lake Piru in Ventura County, and Valley of Fire State Park in Nevada. Interior shots were done at MGM/UA lot. The score was composed and conducted by Lee Holdridge; it was recorded in Rome with members of The Orchestra of the Academy of Santa Cecilia of Rome and the Radio Symphony Orchestra of Rome. The soundtrack album was originally issued by Varèse Sarabande, and subsequently by C.A.M. In 2013 Quartet Records released a 1200-copy limited edition featuring the original album (tracks 1–13, disc 1) and most of the film's score (Holdridge wrote eighty minutes of music for the film; a few cues could not be found, but the album includes music that was not heard in the finished product). 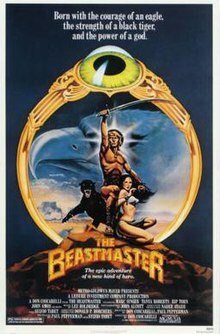 The Beastmaster was planned to open December 25, 1982 until it was announced in July that United Artists had acquired domestic distribution rights and rescheduled the film for a summer release. It was rescheduled to August 1982 had a promotional sneak peek of the film at the Comic Book and Science Fiction Convention in Los Angeles. The Beastmaster premièred in theatres on August 19, 1982. It was released in 16 cities in the United States on 165 screens and opened in eight more cities and 66 screens in its second week. The film opened in fifth place on its opening week. After six weeks, it had a total box office of revenue of $3,561,475. It subsequently received significant local TV and cable airplay, notably HBO and TBS and TNT. The film was shown so often on HBO, that comedian Dennis Miller joked that HBO stood for "Hey, Beastmaster's On". In 1993, a programming director for TNT claimed that it was second-only to Gone with the Wind as the most popular movie to air on the network and attributed its success to its "mythological appeal—it's more serious than the Conan movies." while Another programming director, for Cinemax, stated that "You can come into any part of it and not feel you've missed much." The Beastmaster grossed roughly $14 million on its initial theatrical release. Josh Milrad was nominated for a Young Artist Award for "Best Young Supporting Actor in a Motion Picture" for his co-starring role as Tal in the film. According to Variety, the film opened to mixed reviews. Gene Siskel of the Chicago Tribune gave it two stars out of four and wrote that it "isn't bad as much as it is overlong. After one of the film's major bad guys has been bumped off, the film inexplicably goes on for another 20 minutes. In this sort of brainless adventure film, one climax is enough." Vincent Canby of The New York Times thought the film was "neither better nor worse than 'Conan the Barbarian'" and "looks both big and cheap." Variety wrote, "When 'The Beastmaster' begins, it is very hard to tell what it is all about. An hour later, it is very hard to care what it is all about. Another hour later, it is very hard to remember what it was all about." Kevin Thomas of the Los Angeles Times called it "a veritable comic book adventure come alive" that "succeeds on its own merits." Tom Milne of The Monthly Film Bulletin found the film "marginally livelier" than Conan the Barbarian but criticized the "very basic acting, the appalling post-synching, the sets which resort to disconcertingly ramshackle models, and direction of supreme stodginesss which predictably uses helicopter shots to illustrate the eagle's spying missions (when all it sees as a rule is the hero prancing on the hilltops in self-conscious martial arts poses)." The film holds a score of 46% on Rotten Tomatoes based on 13 reviews, with an average rating of 5.26 out of 10. The Beastmaster received a sequel in 1991 Beastmaster 2: Through the Portal of Time. The film was directed by the original film producer Sylvio Tabet. The direct-to-video third film was released in 1996 titled Beastmaster III: The Eye of Braxus. Both sequels feature Marc Singer in the role of Dar. The films were followed by a syndicated television series in 1999. The television series changes the backstory of Dar who is played by Daniel Goddard. ^ a b c d e "Beastmaster". American Film Institute. Retrieved 15 February 2018. ^ a b "The Beastmaster (1982) Weekend Box Office Results". Box Office Mojo. Retrieved February 15, 2018. ^ a b c d e f g h i j k l m n o p q r s t u v w x The BeastMaster (booklet). Anchor Bay. 2001. DV12015. ^ a b Browne, David (September 10, 1993). "Why The Beastmaster?". Entertainment Weekly. ^ Siskel, Gene (August 27, 1982). "Okay 'Beastmaster' loses in overtime". Chicago Tribune. Section 3, p. 3. ^ Canby, Vincent (August 20, 1982). "Movie: 'Beastmaster,' an Adventure-Fantasy". The New York Times: C19. ^ "The Beastmaster". Variety: 12. August 18, 1982. ^ Milne, Tom (April 1983). "The BeastMaster". The Monthly Film Bulletin. 50 (591): 94. ^ "The Beastmaster". Rotten Tomatoes. Retrieved November 27, 2018.